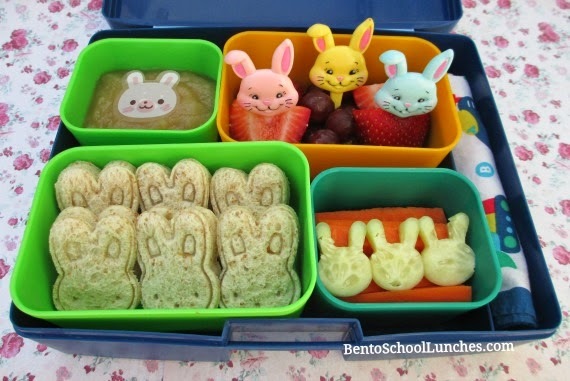 Easter Sunday lands on April 20th this year and I'll be making some Easter themed bentos for school whenever I get the inspiration. I believe I have mentioned how much I love my easy to use and cute cutter and stamp sets. Here I used the bunny set to make a collection of easy to eat mini sandwiches for Nikolai's lunch. I also like sending applesauce in his Laptop Lunches container since it comes with individual lids and they are leak-proof. Bottom left: Bunny shaped sandwiches. Bottom right: Carrot sticks and bunny shaped cucumber slices. Top left: Applesauce with a bunny baran sheet. Top right: Strawberries and grapes with cute bunny cupcake picks. Far right: A spoon for his applesauce wrapped in cloth napkin. Very cute bunnies! Lovely bento!